Is there a corporate hell for the boardroomates who have run US auto companies into the ground for the best interests of their favorite multinational oil companies? The really ironic part is that this will also doom those same oil companies, as mileage increases and eventually electric vehicles eliminate oil demand. Churchill was right. You can't fool all the people all the time. Finally, North Americans are waking up and buying more efficient common sense vehicles. Can't wait to buy a Toyota Prius III with extended electric mode range. Chinese all electric mini vans-cars will be around soon to further compete with North American gas guzzlers and Japanese-Korean makes. Maybe, GM-Ford-Chrysler should concentrate on Hummer like monster gas guzzlers for those of us who still believe that bigger is better. Will car making (specially EVs and batteries) go the same way as TV-Radio-Telephone-Computers-Cameras-Micro-Waves and other electrical-electronic units went? I wouldn't be surprised if it does. Great job unions! Keep demanding your pensions and non-competitive over inflated wages! Congrats! You've destroyed the American auto industry! I work in advertising and American models from 2006 are festering on the lots, waiting for new owners. Credit companies are thriving, and people are learning that there is no surefire low price of gas timeframe, even if they aren't schooled in peak oil. Price volatility is taking it's toll, as it should be. Odd times for all businesses attached to the US Dollar for their business model. Harvey, it's the Toyota Prius version 4 you're looking forward to. The first Prius version was introduced in 1997 and sold only in Japan. Toyota improved the battery and increased the power for version 2, model years 2001-2003. Toyota made further improvements and restyled the bodywork for the current version 3. Prius version 4 will have LiIon batteries and likely have a "plug-in" option as well. In a recent article on Reuters dated 7/25/07 here... http://today.reuters.com/news/articlenews.aspx?type=scienceNews&storyid=2007-07-25T132942Z_01_T153787_RTRUKOC_0_US-TOYOTA-PLUGINS.xml&src=rss it states that the new Prius (Prototype) Plug in Hybrid vehicle can only go 8 miles (Yes it says 8) with a full trunk of Nickel Hydride batteries and that current technology! does not exist to put in lithium-ion batteries, which I beg to differ. Please can someone tune Toyota into Tesla motors who uses them currently in the Tesla and achieve 250 or so on one charge. BIG HELLO TO TOYOTA. Reducing our carbon dioxide in the atmosphere should be our number 1 priority, and since Toyota is not controlled by the US government then it would be easier for them to start this up. Could someone please email a top Exec. at Toyota and let them in on the secret Tesla has discovered. I have looked for CEO etc. email address for Toyota and have not found it. Anyways, just needed to vent. It's nice to know that the production will increase and improvements are still on going for the customer's need.I would love to see new cars which are more fuel efficient and eco-friendly.Goodluck Toyota! More production means more jobs.Toyota cars are always in demand in the market.Personally,i own a toyota vios for three years and i'm a big fan of this car company. It's nice to see jobs are continuously growing inspite of the past recession that invades the whole world.The importance of building business not just benefit the economy but every person who needs the job. I guess it was the main secret of their success or might say in any business,the customer demand should be the top priority.Toyota always know it and always exceed the customers expectation by providing high quality vehicles. Cars and automotives are considered a requirement rather than a luxury nowadays. If you add the cost of commuting between your office and home, or the money you spend whenever you need to go somewhere, you will realize that getting your own car can help you save a lot of money in the long run. In addition, having a car is a great convenience especially when emergency arises. With the economic recession, many people delay their plans of purchasing a brand new car. But the good news is that you can get a car at a fraction of the cost of new car by opting for a used vehicle instead of purchasing your dream car that may shake your budget. Used Cars : Autoweb is a used car website where the public can advertise free of charge - no catch. It was 2007 but at present 2010, Toyota is one of the leading maker of all types of cars and other vehicles. Well,I would also recommend other Japanese autos if you want to buy second hand cars. Customers looking for the most stylish car on the market probably won't be too interested in the 2007 Toyota, but those who need reliability and quality will do well with this car. 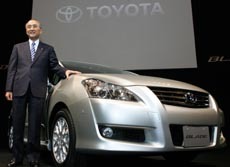 It was obvious all along that Toyota will reign in the automobile industry since they have the strictest quality control and production program the world has ever seen! It makes them look like they are hungry for Innovation! Lean Manufacturing is definitely the secret. I got to know what makes Toyota tick through our company's lean presentations and seminars. The lean manufacturing presentation made me realize that little good things add up into something really big. According to lean's production practice, just the simple way of sitting properly on your workplace reduces the expenditure of extra effort and energy, hasting your production and in turn, a company's fast production will lead to its success! It's amazing, really! Their applications to LEDs are also very promising. Sounds like this development of nanotechnology will have a bright future (pun intended) in energy applications.